The key to Riley’s heart these days? Robots. More specifically Transformers. 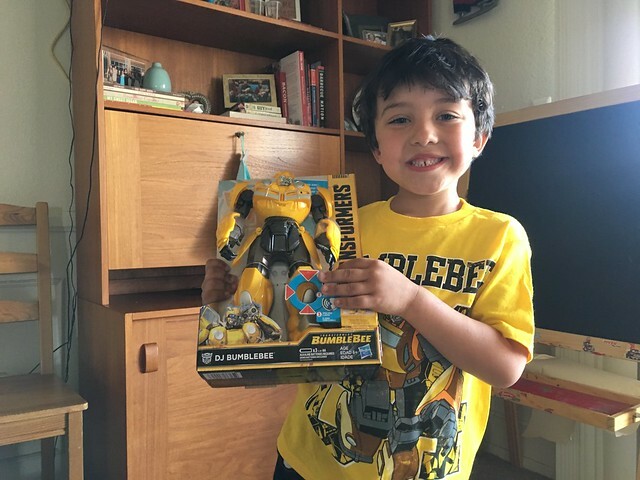 So when my friends at Paramount reached out and asked if I’d be interested in reviewing the new Bumblebee movie and receiving a fun gift kit, I did not hesitate to say YESSSSSSS. Fast forward to a week later and a magical box of surprises appeared at our door. 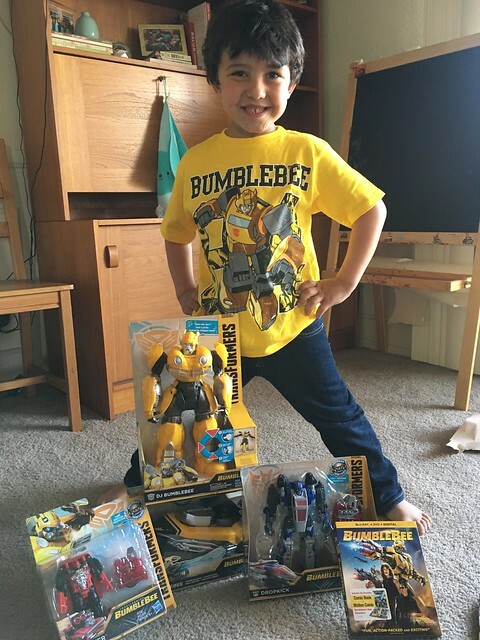 I told Riley to get his Bumblebee shirt on and that this box was a special surprise for him from my friends. And guys. I instantly became the coolest mom on the block. Not only did we get the Bumblebee movie. But there was an actual Bumblebee. Two other transformers. A Bumblebee shooter. I mean, have you seen a happier kid than this? And I honestly felt on top of the world. I mean, it was like surprise Christmas. So many robots. And what was the cherry on top? Actually watching the movie with Riley. Now I get that four may be a bit young to really take in the whole movie. But honestly, he did pretty good. I know a lot of the storyline went over his head, but the special effects are amazing and all he cared about was watching his favorite Transformer on the screen. And seriously, who doesn’t LOVE Bumblebee? The movie itself was a delight (you can check out the full preview here). Hailee Steinfeld continues to be amazing (seriously, she’s just so good) even as an angsty girl of the 80s. The overall story is the origin of Optimus Prime sending Bumblee to defend Earth from Decepticons. And Hailee’s character, Charlie, stumbles upon Bumblebee and together they become an awesome team. I loved all the retro throwbacks and the funny quirks of Bumblebee, the robot. And honestly, Riley just loved it. And I loved seeing him love it. In any case, if you liked any of the Transformers movies in the past (or heck, even if you didn’t), there’s a very strong chance that you’ll love this one. Trust me.